My wife and I had our first game of Bolt Action the other night – needless to say my wife’s Germans defended the village well, winning her the game. Sooo…. I need more hedges for cover!!! Thanks to my wife, she pointed me in the direction of a webpage with a guide on how to make some hedges. The page was Six-D-Six. I used it as a guide – kind of – to make some of my own hedges. The main difference was that they flocked theirs. I painted mine. The main reason was that I only have one colour of flock and I couldn’t flock the hedge the same as the ground. D’Oh. Anyway, a quick trip to the craft store got me 50 large lollypop style sticks – 6 inches long – for £1. The bargain shop next door had a pack of 8 flat scourers for £1. The only other thing was to dig out the glue gun. 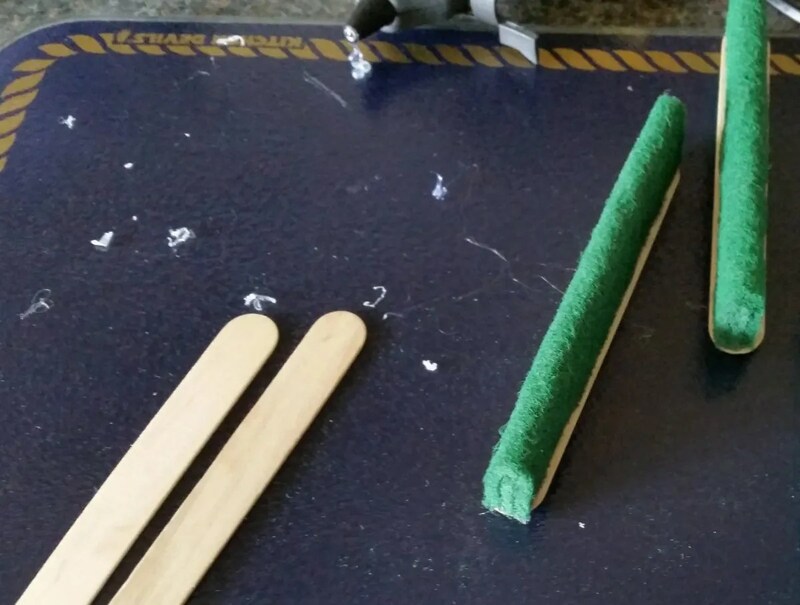 After cutting the scourers to size, I glued a core piece to the centre, then folded them over. All I had to do then was glue them to the “lollypop stick”. Glue gun essential. Once this had dried. All I had to do was spray them brown – I used Halfords Camo Brown – although I’m sure there are much cheaper sprays – that was the one I had in the garage though. 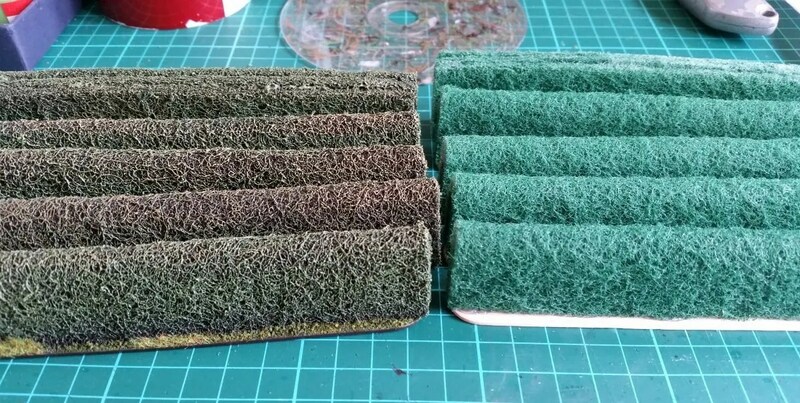 To finish, all I needed to do was use a large drybrush to drybrush on the following colours working my way higher up the hedge each time; Castellan Green (GW), Loren Forest (GW), Goblin Green (AP) and Desert Yellow (AP). The base was re-touched up with brown then flocked. 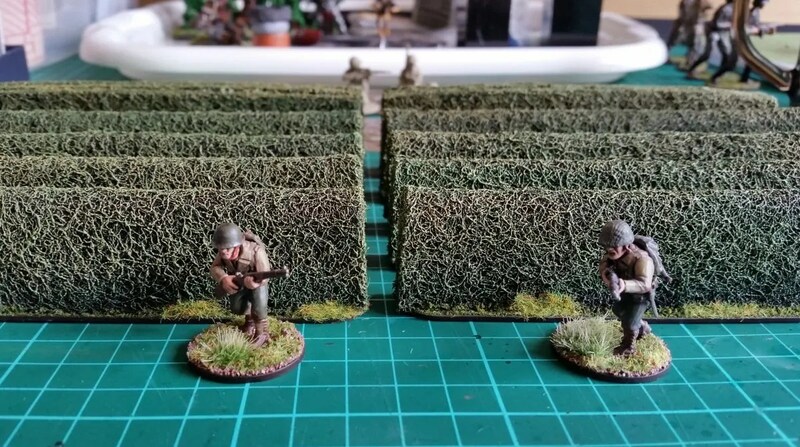 A few glue-gun sticks, some brown spray and £2 worth of parts made 10 hedges. There were 8 made from folding and I used the leftover parts to make a pair of triple-ply hedges. 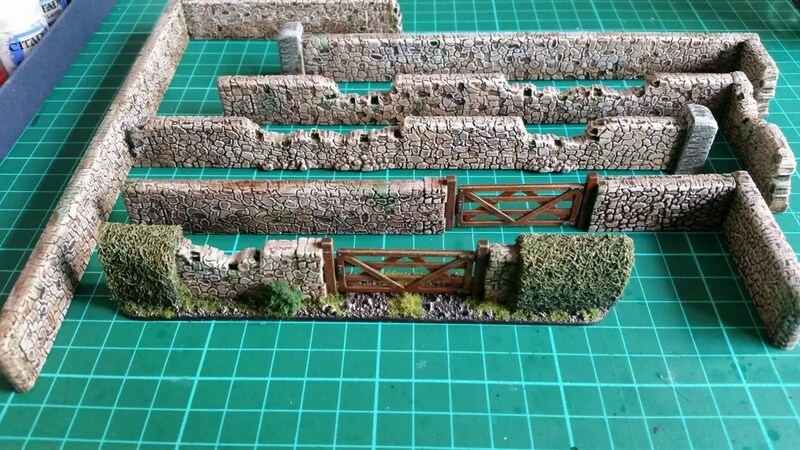 EDIT: I’ve added a pic of the Stone Walls I’ve just finished painting and varnishing. I used the last few pieces to make a small fenced hedge section that will connect the other hedges up using the last ends of scourer.